Production: Conseil Départemental d’Indre et Loire/ TALM-Tours. Insula is a sculpture which refers to the etymology of the word island (insular). Insula in fact means both “in the middle of water” but also a collective habitat (a dwelling place surround by streets). Another meaning is that of an area of the brain. 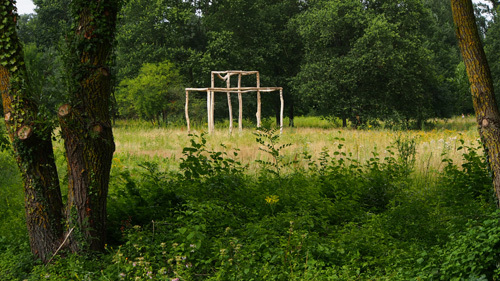 Insula is a construction made of rough wood, “standing dead ”, found on the spot, which borrows the drawing on a smaller scale of two parallelipipeds representing collective habitats. The interplay between pure geometric form and form drawn by the pieces of wood with organic lines echoes the very place of the installation, the natural environment which is the Ile de la Métairie, and its history, but also nearby collective dwellings.